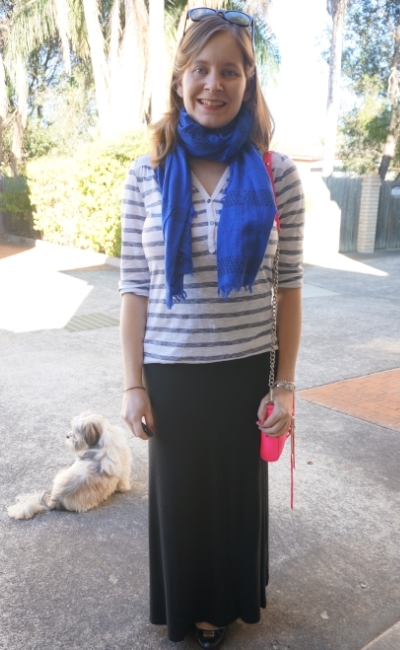 As I mentioned in my previous post, I'll happily wear maxi skirts year round, as we don't have snow to contend with over winter in Brisbane. I have been looking out my long sleeved tops to wear with them now though! I have a few long sleeved henley tops, they are a nice casual option and perfect stay at home mum wear. This was a really simple outfit. It was a cold morning, I was recovering from the cold and baby boy was sick as well, but toddler T was fully recovered and ready to play! I did contemplate wearing my trackie dacks (sweats/joggers) to go out... I usually reserve those for at home wear only. I had to change my top anyway thanks to baby boy, so I picked out this maxi skirt at the same time I was choosing the henley. The jersey fabric is just as comfortable as my trackie dacks but because it's a maxi skirt it looks a lot more pulled together. Last worn: Ray-Ban Wayfarer, striped henley, black jersey maxi skirt, Marc Jacobs ballet flats, Rebecca Minkoff pink mini MAC. First time I've worn the cobalt scarf as it is a recent purchase. Other ways to wear: striped henley and denim shorts in spring, black jersey maxi skirt and a baby bump, Marc Jacobs ballet flats and skinny jeans, Rebecca Minkoff pink mini MAC and navy kimono. I adored this outfit. When I saw the blue and teal skull print scarf I knew I wanted to wear it with this top. While the scarf was on massive sale and a great price, thinking of this top with it is what made me add it to my cart. I felt stylish, pulled together, was over my cold...and then baby spat up all over my shoulder. Didn't feel so great then, haha! It's one of the reasons I'm glad I got into the habit before kids of taking photos of my outfits each morning when I go out - with two boys under 2 my clothes never stay clean long! By the end of the day at least one of us has had to change what we are wearing, and I'm likely to be in my pyjamas or the above mentioned trackie dacks. I'm glad I bought this. I know I have a lot of scarves but I was feeling like I needed to add some blue ones to my collection. As this one is woolen, it's cosy and perfect for winter. Last worn: Ray-Ban Wayfarer (above), blue and green skull scarf, teal henley, grey marle maxi skirt, black ankle boots, Rebecca Minkoff aqua mini MAC. Other ways to wear: skull scarf and stripes, teal henley and a striped skirt, grey maxi skirt and a green tank in summer, black ankle boots and a grey skater dress, aqua mini MAC and a navy kimono. Linking up with Passion For Fashion, Style Sessions, The Ultimate Rabbit Hole, Modest Monday. That AMcQ scarf WAS a perfect buy. It looks so posh and it's a great colour on you! Such a bargain price too! I feel you on the frequent need to change, but just like you I make an effort to wear my sweats at home only. I never wanted to become one of these mums that run around in sweatpants all day, but I have to say I feel the temptation quite frequently. I love your look! That scarf is gorgeous. Yep it's starting ti get really chilly here! Super cute!!! And yea, you're lucky. There are a lot of things I can't really wear that much in the Winter here because of snow. Snow must be difficult to dress for! Love the vibrant blue of your scarf! And your python embossed mini Mac is very cute too. Both looks are so comfy and cute--and the scarves really pull everything together. The colors in your second look are GORGEOUS! I love the shades of turquoise and aqua together, so pretty! That first scarf is very cute!! Love the color! That bright pink bag is so nice! Mica, you look beautiful in both looks, but I especially love the last one, the colors are so lovely together! I I hope you and the little one are feeling much better now! PS: I thought you'd like to know that the Zara moto jacket I wore that you liked is now on sale for $50, both the yellow I wore and the blue, which I'm sure you'd love! Check out their site ;) I hope you have a wonderful weekend ahead, beauty, and thanks so much for sharing! Aww thank you Jalisa! Those jackets are such a bargain! Sadly Zara doesn't have an online store in Australia so I'll need to check out the store when I'm next in the city. Your looks are always so wearable and eye-catching at the same time. Love how you combine neutrals or classic patterns with brighter colors. I can see why you adored the second outfit, it's beautiful and those colors look amazing together! I love both looks but the second one is definitely the winner for me. You look amazing in both but in the second outfit you look sophisticated and chic. Oh gosh, I'm glad my little one is two and am way over the puking stage. I remembered it too well and my husband was the one who got the most of it. Actually there was once we went out for food and baby decided to poop all over him too. Thank goodness the restaurant was in our condo compound so he could quickly go home and change. LOL! Oh your poor hubby! We've been lucky that there haven't been too many messes this time around but that could easily change, haha! Babies are messy! I love the teal henley in the second look, the color is so pretty! I love both of the looks and that pink bag is so cute! So, is it winter time in Australia now? I have heard that the seasons in Aussy is somehow different. And I hope the baby feel better soon! It must be the weather changed! Yep different seasons in the southern hemisphere! :) There are definitely a lot of bugs going around with the cold weather! 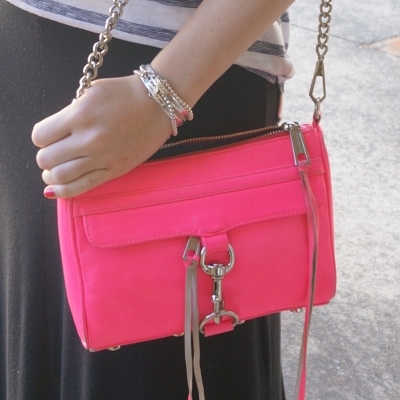 Those Rebecca Minkoff bags are adorable! The second is more my color. Also adore your second outfit more than the first. The first looks awesome with a patterned shirt and plain scarf. I love seeing you style your skirts for all seasons and both maternity and non-maternity. That pink bag is too cute. They have been such a great purchase! 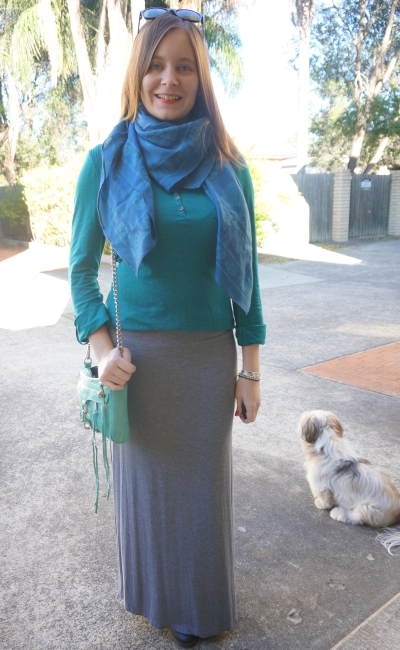 Gorgeous blue scarf and green bag. Lovely picks! I love the colours in the second outfit - you are so co-ordinated and you sure know how to rock a maxi skirt! I love how Cooper always gets a piece of the action too! Love the color of that first scarf! I'm glad everyone is starting to feel better Mica. That is a cute way to wear a Henley! I didn't think of that. Always wore mine with pants. Now I have a new way! You always give me such great ideas. That blue is gorgeous on you in the second outfit. Glad I could give you some ideas Kim! I never realised those tops were called 'henley' before as they are my favourite type to wear! So relaxed and effortless! 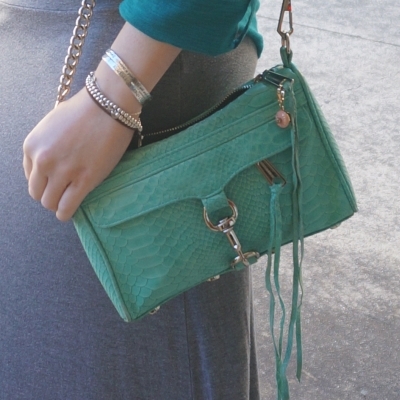 Both your bags add such great pops of colour to your outfits! love all the blues in your second outfit, it's a colour I can wear every single day!! I really like how you paired both of these tops with maxi skirts. Makes them more "you." Plus, henley is insanely comfortable! Isn't opposite sick schedules how it works? lol People forget that when parents get sick, especially mamas who are breastfeeding, you can't actually "be sick." You still have to be the MVP. I hope everyone is now at 100%. I'm slightly behind with blog reading. (; Hey, at least scarves can camouflage baby spit up when you're out and about. Oh blue and teal together...yet another unexpected combination that looks wonderful Mica.